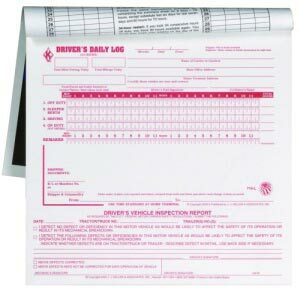 JJ Keller's 2-In-1 Duplicate Driver's Daily Logbooks (DDL), include a Simplified Vehicle Inspection report on the bottom section, reducing the total cost of FMCSA's logging requirements. The VIRs can be detached for storing separately. Except for a private motor carrier of passengers (nonbusiness), every motor carrier shall require every driver used by the motor carrier to record his/her duty status for each 24 hour period Source: DOT FMCSA § 395.8 Driver's record of duty status. Every motor carrier shall require its drivers to report, and every driver shall prepare a report in writing at the completion of each day's work on each vehicle operated. Source: DOT FMCSA § 396.11 Driver's vehicle inspection reports. Before driving a motor vehicle, the driver shall: (a) Be satisfied that the motor vehicle is in safe operating condition; (b) Review the last driver vehicle inspection report; and (c) Sign the report, only if defects or deficiencies were noted by the driver who prepared the report, to acknowledge that the driver has reviewed it and that there is a certification that the required repairs have been performed. Source: DOT FMCSA § 396.13 Driver inspection.